In 2013, CCAFS surpassed the 3-year targets for two of its twelve Objectives, achieved the targets for seven Objectives and is behind target for three Objectives. Most progress has been made in East Africa (EA), West Africa (WA) and South Asia (SA) – the regions established at the start of CCAFS; but there have been significant outcomes in the recently established region of Latin America (LAM), with less progress in South East Asia (SEA). CCAFS. 2014. 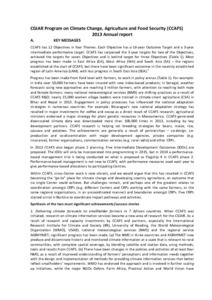 2013 Annual Report to CGIAR Consortium. CGIAR Research Program on Climate Change, Agriculture and Food Security (CCAFS). Copenhagen, Denmark.